Finding time to work on the Marvel posting the last two weeks has met the wall hard. Last week I couldn’t do anything because of all the running around and this week it was snow…stopping me from running around. And then having to move it. But this allows me to do a quick look at the next few Marvel Tuesday reviews. 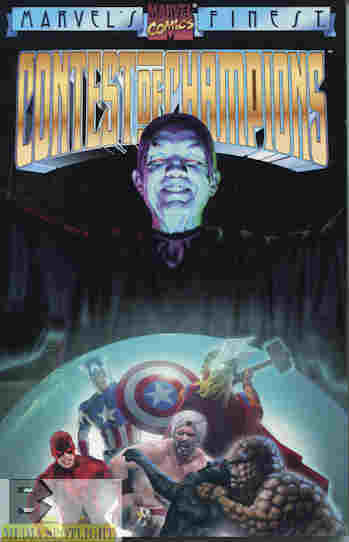 Contest Of Champions is one of the early crossover events, originally planned for a tie-in to the 1979 Olympics. However, certain miscommunication issues led to a 3-part miniseries…in 1982…that later had to be finished in two Avengers annuals to bypass a plothole. I picked up this “Marvel’s Finest” trade back when Contest Of Champions II came out in 1999…and I’m missing the last few issues of that miniseries. I’ve never actually had a chance to read this one so unlike the others, where I just forgot the stories in the sea of tales flowing through my head, this will be completely new to me. I may review the collection as a whole for The Clutter Reports and Reviewers Unknown. There may be some interesting goofs as they had to cover for changes in character designs in the 3 years between and varioius roster changes. Because I’m getting them from a trade I’ll have to hunt down the individual covers elsewhere but there’s the cover for this collection, which will cover Marvel Super Hero Contest Of Champions #1-3, West Coast Avengers Annual #2, and Avengers Annual #16. Again, although I’ve had this book since 1999, I’ve never read the comic so don’t ruin it for me, please. Now, you all know how much I hate “hero vs. hero” stories because I’d rather see heroes fighting villains, so we’ll see if this finds a way to make it work for me or if I’m just going to be annoyed by the whole thing. I actually do enjoy the DC Vs. Marvel/Marvel VS. DC story so maybe this will work. We’ll all find out starting next week. Posted by ShadowWing Tronix on February 4, 2014 in Marvel Spotlight, Yesterday's Comics and tagged Avenger, Marvel, Marvel Comics.